Candies add color and decoration to the cake without requiring special skills or much time. Before the excitement of a child's party begins, you may be frantically preparing the food, decorations and activities. But decorating a special cake for your child needn't take a lot of time and will make the party dessert more meaningful. With a few shortcuts and a simple yet creative design, keep the task of cake-making from taking up all your energy before the guests arrive. Cake baking heats up the kitchen and adds to the overall time it takes to complete the birthday cake. Instead of firing up your own oven, let someone else do the work. Most bakeries offer plain, baked cakes for sale. Some even give them a layer of frosting for more time savings. If you want to bake your own cake, use a cake mix, substituting milk for the water and adding an extra egg to get a dense texture that is more like a cake made from scratch. Turn a sheet cake into a custom dessert by cutting it into a shape based on the party theme. For example, cut a large sheet cake into the shape of a castle for a princess party or a fire truck for a firefighter theme. Simply cut the outline of the shape using a sharp knife. A template in the shape placed on top of the cake gives you a guide. Frost the cake and add accents to make it look more realistic. Frosting and fondant are the usual materials for cake decorations, but other options simplify the cake-decorating process. For a child's cake, use candies to brighten up the design. Any type of candy works, including candy-coated chocolate circles, wafer candies, fruit slice candies or miniature candy bars. 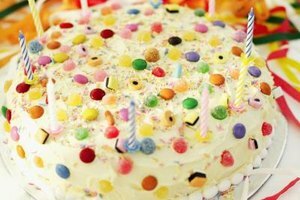 Use round candies to make a polka-dot cake, fruit slice candies for a mouth or licorice whips for stripes. Use store-bought cookies in a particular shape, such as animals, flowers or letters, to complete the cake design. Place a toy that fits the theme in the icing; just make sure everyone knows it's not edible. Cupcakes are an easy, child-friendly birthday cake option for your child's party. Get the birthday child involved in mixing the batter and filling the cupcake pan. When they cool completely, add a dollop of icing and some sprinkles on top to complete the party dessert. For variety, add food coloring to the batter for colorful cupcakes. Dress up cupcakes by arranging them into a particular shape on the serving tray, such as a giant star or a flower.